Contemporary historians regard the beginning of de-Stalinization as a significant turning point in the history of the Soviet Union. It began during the Khrushchev Thaw. However, it subsided during the Brezhnev period and remained so until the mid-1980s, when it accelerated once again due to policies of perestroika and glasnost under Mikhail Gorbachev. De-Stalinization meant a complete end to the role of large-scale forced labour in the economy. The process of freeing Gulag prisoners was started by Lavrentiy Beria, but he was soon removed from power (arrested on June 26, 1953; executed on December 24, 1953). In turn, Nikita Khrushchev then emerged as the most powerful Soviet politician. Many argue that the watershed moment of de-Stalinization was when Khrushchev gave a speech entitled "On the Cult of Personality and Its Consequences", concerning Stalin. On 25 February 1956, he spoke to a closed session of the Twentieth Party Congress of the Communist Party of the Soviet Union. Khrushchev thoroughly shocked his listeners by denouncing Stalin's dictatorial rule and his cult of personality as inconsistent with communist and Party ideology. Among other points, he condemned the treatment of the Old Bolsheviks, people who had supported communism before the revolution, many of whom Stalin had executed as traitors. Khrushchev also attacked the crimes committed by associates of Beria. As part of the de-Stalinization push, Khrushchev endeavored to have many places bearing Stalin's name renamed or reverted to their former names, including cities, landmarks, and other facilities. These included even capital cities of the Soviet republics and territories: in 1961, Stalinabad, capital of the Tajikistan, was renamed Dushanbe; Staliniri, capital of the South Ossetian Autonomous Oblast, was renamed Tskhinvali; and Stalingrad, a major industrial center of the Russian Soviet Federative Socialist Republic, was renamed Volgograd. In Ukraine, the Stalino Oblast and its capital, also named Stalino, were renamed Donetsk Oblast and Donetsk. 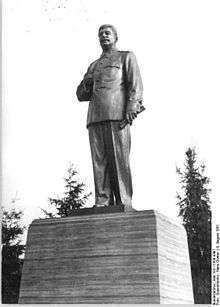 The Statue of Stalin on Stalinallee in Berlin-Friedrichshain was removed in 1961. One of the most important effects of de-Stalinization was to open Soviet cultural life. Doing this enabled artists and intellectuals to be more open and this led to learning more about Western culture. This included new music such as jazz, swing, and rock and roll. Published literature started to drop its political undertones and became more about the readers' and their personal lives and fantasies. Young people were among the largest demographic to grasp this new culture. There were new clothing trends, musical choices, and most of all budding nightclubs. Not everyone in the Soviet Union was so open to new cultural trends. A security officer working one of the booming nightclubs in 1956 made a comment, "All this energy could be invested in building a hydro-electric power station, rather than wasted here on a dance floor." Even though not everyone agreed with these changes there was no longer a fear of execution and punishment of family and friends. ↑ "Gulag : Soviet Prison Camps and their Legacy" (PDF). Gulaghistory.org. Retrieved 2013-10-12. ↑ "Gulag: Soviet Forced Labor Camps and the Struggle for Freedom". Gulaghistory.org. Retrieved 2013-10-12. ↑ G.R.F. Bursa (1985). "Political Changes of Names of Soviet Towns". Slavonic and East European Review. 63. ↑ Gwillim Law. "Regions of Tajikistan". Administrative Divisions of Countries ("Statoids"). Retrieved 21 November 2010. ↑ Gwillim Law. "Regions of Georgia". Administrative Divisions of Countries ("Statoids"). Retrieved 21 November 2010. ↑ "CNN Interactive - Almanac - October 31". CNN. (October 31) 1961, Russia's de-Stalinisation program reached a climax when his body was removed from the mausoleum in Red Square and re-buried. ↑ Reuters (1961-11-11). "Stalingrad Name Changed". The New York Times. MOSCOW, Saturday, Nov. 11 (Reuters) -- The "Hero City" of Stalingrad has been renamed Volgograd, the Soviet Communist party newspaper Pravda reported today. ↑ Hunt, Michael (2004). The World Transformed, 1945 To The Present. New York City: Oxford University Press. pp. 154–5. ISBN 9780199371020.